I created my daughter's Montessori nursery almost entirely from IKEA... so much so that I actually asked IKEA if I could curate a Montessori nursery in store (they said 'no' on account of having to roll something like that out in ALL stores - which of course I was fine with, but the answer was still no). Even so, there really are some great finds at IKEA for a Montessori nursery and here are my top 5. 1. Floor Bed: If you are looking for a floor bed, getting one that is comfortable, firm and low enough to accommodate a baby who might roll off occasionally can be hard to find. This mattress is a great size and you can get it as a crib, toddler, or twin size. I liked to opt for the twin so that when my daughter was a toddler, we'd just have to get a frame! Never heard of a floor bed? Find out more here! 2. Child-Size Dresser: Let's consider the period of time when the child is learning to self-dress, which do you think? The first six years... or after? The first six years, right? But most nursery dressers are adult-size, with big, heavy drawers that a child under six can hardly use on their own! Getting a dresser that is dimensioned to the child's early childhood size allows them to actually use it during the time we want them to take ownership of their dressing needs! Plus, when we get this in infancy, it can double as a changing table when you put a changing pad on top! You've now unburdened yourself (and your wallet) of two bulky pieces of furniture! For this hack, leave out one of the shelf plates so that half the unit can be used to hang jackets, sweaters and the like. 3. Low, Open Shelves: Children don't have what's called "object permanence" until about 8-9 months - the realization that an object that is hidden is still there. So when we store their toys in closed toy bins, they have no idea what options they have and rely on the adult to continuously engage them with their toys. Low, open shelves are a great addition to the play space where you can display a few toys for the child to choose from. Plus, this helps them see where they need to go when they are able to start putting their toys away. Want some more ideas about play and movement, learn more here! 4. Eating Supplies: The child whose eating supplies look like the adult's eating supplies is more connected to the meal and the community experience of food. They don't feel "separate" when they can look around and think, "My eating experience is just like your eating experience!" IKEA has some great additions to the child's eating space! Want to watch a child from the start of solids to 12 months learn to use all these materials (and more?) Watch our tutorial here. 5. Mirror: A mirror is a great addition to a play space for the young infant! 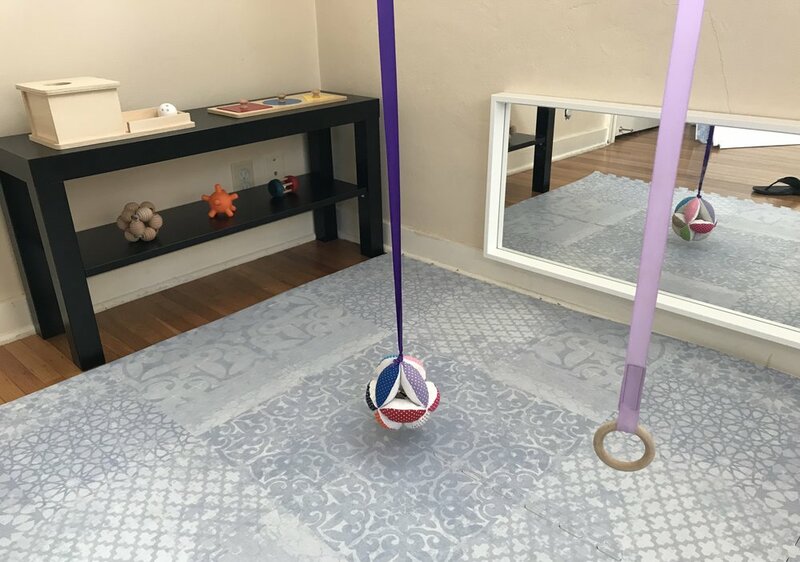 Often, the young infant's motor coordination isn't strong enough to be able to purposeful turn toward sounds or sights that might be interesting to them - but a mirror positioned horizontally along their play space means they can not only see themselves, but also the space around them! This particular mirror has a wonderful ledge that the later infant who is pulling to stand can use to pull themselves up! Want to see this play space in action? Watch a child development movement along-side developmentally accessible toys with this tutorial here. Ok, so this one isn't from IKEA, but it's been on my "must have" baby list ever since my daughter was born. Baby wearing is a great way to keep baby close for bonding, ease of travel, and a big space saver, but there always tends to be the stuff problem. Your diaper bag or purse slide off your shoulder incessantly and if you wanted to carry a water bottle, your hands are just never free (and isn't that supposed to be one of the benefits of baby wearing?!). 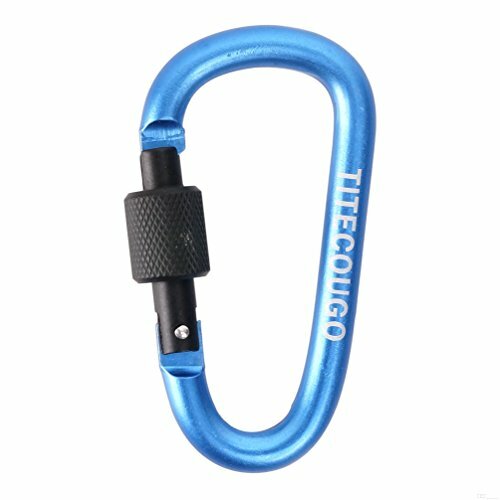 Enter, the carabiner. Just clip your bag to the carrier to prevent slipping or clip your water bottle to the sides. Happy baby-ing!